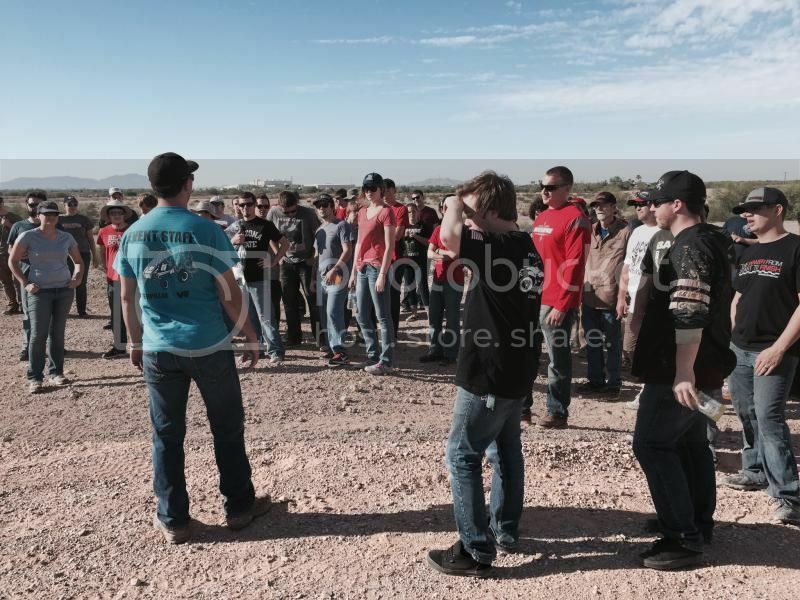 So over the past week, all of the currently active Arizona SAE Baja chapters organized a quick little race in the Desert to test out last years cars, give the new members something to be excited about, and of course to do some important driver training in a relaxed, yet competitive atmosphere. Friday afternoon I headed out into the desert with a print out from Google earth, and a rough idea of the course I wanted to layout. 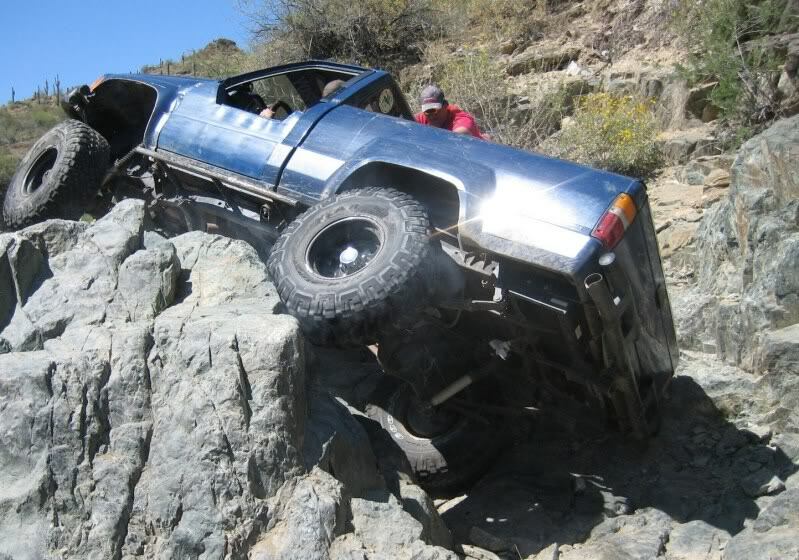 Two hours later (in the dark and after busting a tie rod due to the lack of headlights in said darkness), I had laid out a 0.8 mile course that included loose sand washes, rutted out hill climbs, berms, high speed sections, and an optiona short cut that ivluded tires and logs. The next morning after the teams had arrived (ASU-Tempe, ASU-Polytechnic, and U of A with two cars), we went through a quick drivers meeting, and walked the course, getting volunteer course workers in key places (Since this was a "Non-Organized" event, we couldn't really keep other OHV's from entering the course). The two hour endurance began at 9:00, with a four car wide holeshot race. After 2 laps ASU-Tempe was out of the race after a gearbox bearing decided to remove itself from the gearbox. Outside of that, ASU-Poly had one rollover and one broken tie rod, and U of A ran both cars flawlessly for entirety of the two hour race. Hopefully we can get all of our pictures in one place soon, but enjoy the pics in the mean time! If we get this to happen again this year who is interested in coming out? 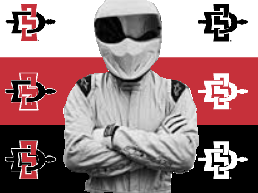 Depending on the dates, San Diego State will be there with anywhere from one to three cars. You have a date in mind yet? And maybe a location? "To finish first, you must first finish"
If it's close enough to Vegas and doesn't conflict with school we might go out. UA will be there for sure. Any place works for us! We will have 1-3 cars. Is there any news on if NAU is going to go this year? Last year was the first time they competed in a while, but it would be fun to see them compete! Bump for interest? Right now I am leaning towards thunder rock mid-late October. If someone has a date that works for them, throw it out. Saturday the 18th of October works well for us. We have members out of town for a conference the next weekend. The 18th works for the U of A. We should have two cars there like last year. Since we look like we may have 5+ cars, are we going to do a mini-tech inspection? I know the last few years haven't really done anything. It would be good for new members to at least get used to how it works. I have a contact, and have sent an email to the NAU program this morning. I hope not. We tore apart our only car after Illinois and converted it from manual to CVT to get some data and is now pretty illegal in regards to power train guards. But we could probably have some simple chain guards done by then. We dont need to go through all the rules, but the cars should be safe. We do some things like that too, like removing the spill guards (because they tend to cause more spilling then they prevent because of how awkward filling becomes). But I think we should at least check harnesses, kill switches, frames, maybe some sort of powertrain guards etc. Harnesses, kill switches, helmets, wrist restraints, and frames will always be inspected. BTW, I just spoke with the owner of Thunder Rock Off Road Ranch, and they unfortunately will not be open/available that weekend. Judging on the number of cars, and people, I am currently leaning towards the Gila Bend location. Hi guys, I am the President for SAE at NAU. We are more than happy to attend this coming race. We have our vehicle form last year. Is it for sure going to be the 18th as of now? And we need our cvt covers correct? Our currently will have to be reconstructed. We are open to where ever for location. Thank you for inviting us this year. We are excited at the idea of having you guys out there! We are excited to be there. Are we currently looking at the gila bend area for the race? Any idea of a general time when the race would start? Since it is the desert, we usually like to start fairly early, but we have never had a team travel that far. How early do you think you guys could be there and ready? The location is going to be Gila Bend correct? It looks that way as of now. NAU will be there. We will have one car. So for teams arriving the night before the race what is the situation? Will we have access to the facility the night before to set up and get our cars ready and possibly camp there overnight? Hi. UNlV SAE president here. We were planning on arriving the night before and camping out but the only official campsite Im aware of is 13 miles away from Gila Bend. It's called Painted Rock Petroglyph Site. If there's some place closer besides the side of the road we would like to know about it. Tony, we need more details please and make that ASAP! I'm trying to plan this trip for our members but have no info to give them at all besides the race is in Gila Bend. Where is the race site at? Can we camp there? How strict will tech be? If I don't get enough info soon, UNLV may not be able to make it. We would really like to be there so help us out! Thanks! Sorry for the lack of info. My computer at work crashed, and I tried to use my wifes computer with very little success. 1) Run course in green only. This course is "easy". It is also very compact with great visibility of course. Course is 3 miles long. 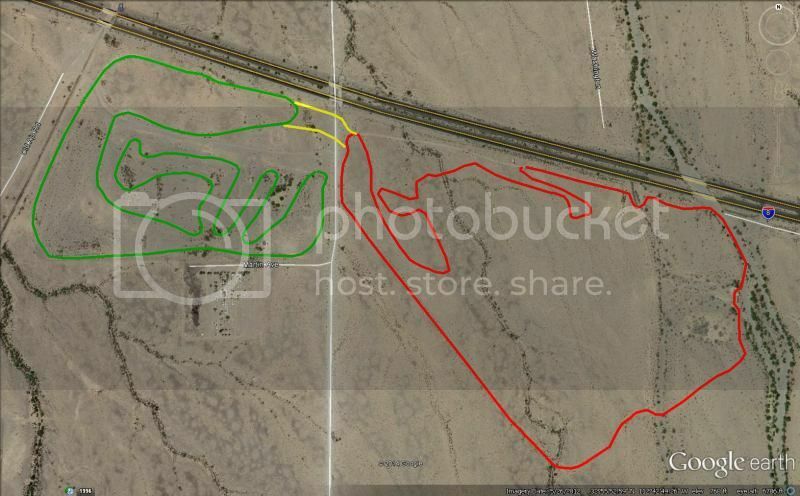 3) Run Both Red and Green courses combined (at yellow sections). The major downside to this is that it will include crossing a road. The road has traffic of ~1 car/hr. We would need to set up a flag man with a stop on each lap. Combined course should be ~6 miles long. Because this is just desert, we have historically camped on site. Can we get an acttual location. We have never been there. Or directions? After going under the highway, you are there. Historically we have camped on the left side of the road. Is everyone planning on getting there on Friday and camping out where Tony suggests? We'll probably get there round 6pm on Friday because a lot of us have a morning class so we won't be leaving Vegas til like 12-1. Hoople, Are you going to be part of the design review on Friday? I am going to be up there at UNLV as part of the design review panel. As of right now there is about an 85% chance I will be driving a Rally Fighter back. It would be nice if we could caravan down. According to Mr. O'Toole the design review should be done around 11:45. I am good to go after that. Yep! I'll be there. We should definitely caravan! I wasn't sure if you had other plans after the class. I remember now that Otoole mentioned about the Rally Fighter. We'll try to get everything loaded before the class so we can leave as soon as possible. Sorry for the late notice. ASU- Tempe will be there with one car. Also, if anyone could bring a spare 200mm CVTech belt that would be helpful. I finished dremeling smooth a big 'ol gouge in our P90 primary and am hoping that doesn't kill the belt. I have a CVTech primary as a spare but no belt. As far as people go, U of A usually brings out about 20 people, so we usually have enough course workers. Richie, don't worry about me, I will keep myself entertained! We are bringing three cars as of right now. We are leaving Tucson Friday evening around 7:30 since there is an exam in the afternoon for many of our members. There are also some parents who would like to attend and will be bringing various off-road vehicles that can be used for recovery if there is not enough. We should also have enough people to stand at various locations around the course and possibly at the road if we choose to use the full course. Everyone is really looking forward to this weekend for sure. I know some families have already volunteered from UA as recovery crew. They both have Arctic Cat Wildcats which should have no issue towing people in. They are also going to camp and go out before us around 630pm. I think that maybe for the first hour or so we just run course 1, easier for people to watch and recovery crews. Then if most the teams are still going strong we can open up the tougher section as well to make it harder. Glad to hear we will have more recovery vehicles available as needed. I went out yesterday at lunch to make sure everything looked good, and it does. Just a reminder, I will be looking for appropriate safety gear for EVERYONE. 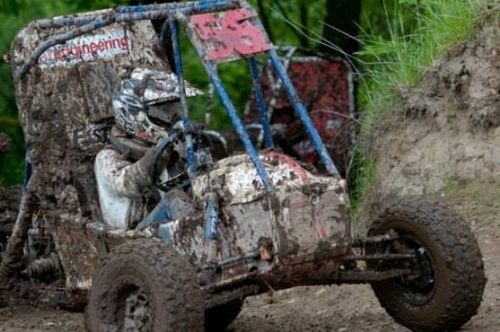 If you are on recovery in a UTV, please have helmet, goggles, gloves, etc. 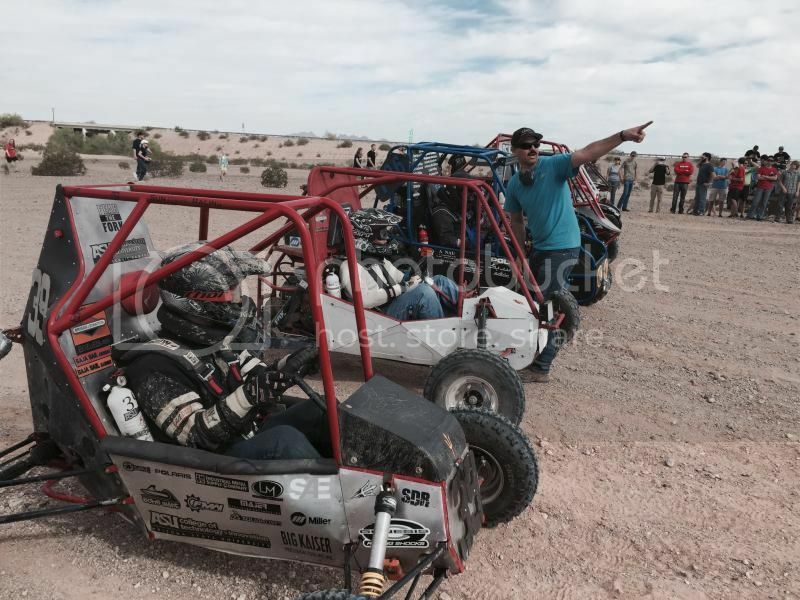 If you are driving a Baja Car, Helmet, Goggles, Gloves, Pants, Fire Resistant Upper Garment, Wrist Restraints, neck brace. Also, please make sure you have your fire extinguishers charged and mounted, and make sure to bring your spares. I will want those near the fueling pits. Once again, thank you to everyone who came out, and everyone who helped make it go so smoothly. I can't wait to do it again! Is it going to be around October again? ASU Poly will be there with three cars, just let us know when and where. UTEP would be interested, depending on logistics. As mentioned before, depending on the number of cars, we might be jumping in on an AZOP race. Right now, that would be the Prescott Valley race (October 24-25), that will go through downtown Prescott Valley, and include a 4 mile loop that includes jumps and an endurocross section. Sounds awesome. A chance to display the cars in downtown could be a good fundraiser or way to get sponsorship for teams too. That date is really close to the Baja 1000, which tends to be a pretty busy time at work. But if this turns into an actual race, I'll do all I can to bring a car (stock engine). If this is part of another orgs. 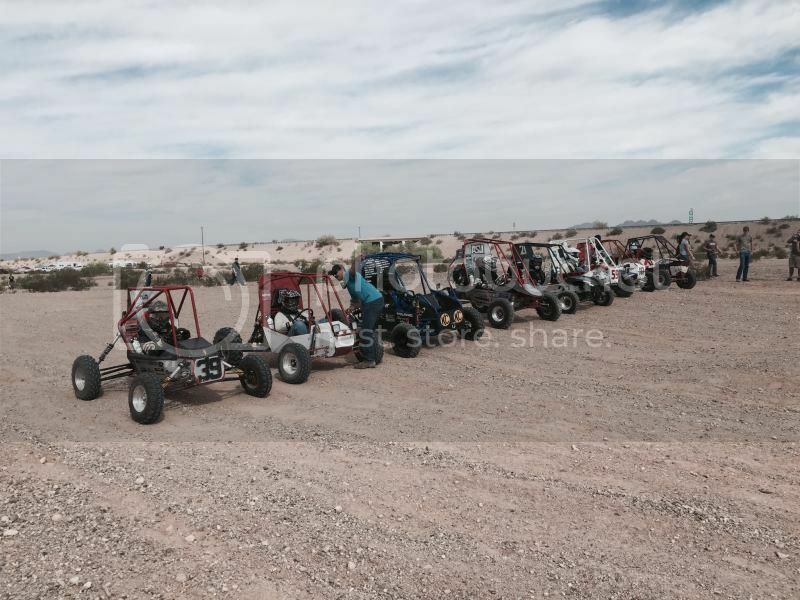 desert race, I would assume it will be acceptable to stop on course to make repairs and/or change a tire? Let's make it happen!